Last week, Amy Ou(at Chef's Secrets) gave me some wine sampling. It was Dried Raisins wine. It was drunk cold and doesn't have the strong wine flavour. It tasted a bit like champagne that has gone flat. 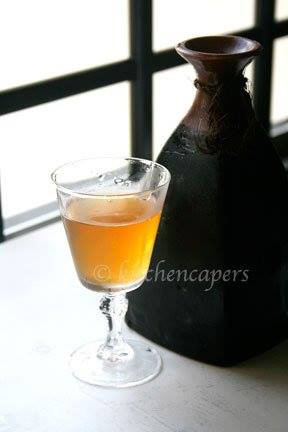 It leaves a lingering taste on your tongue, and its sweet. 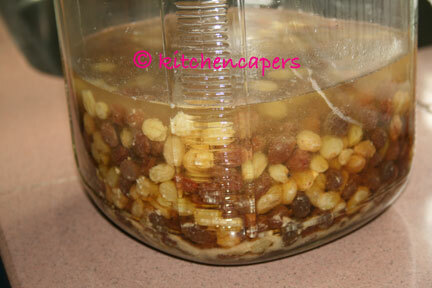 Here's my Dried Raisins Wine fermentation : Day 2. I have used both golden and black raisins for this. This wine is about 30 days old. The wine is darker in colour now. Due to the dark raisins. And I am trying it with Dried Cranberries too. I made only 100g just to see if it works. Dried Raisins Wine, at its best.. Best to be drunk when its cold. 1. Place water and sugar in a large pot and bring to a boil; stir until rock sugar is dissolved. Leave to cool completely. It is important to cool the syrup thoroughly. 2. 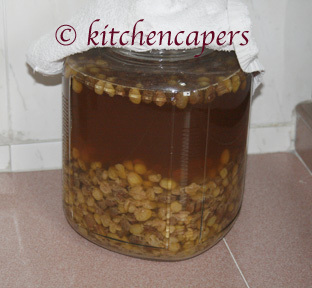 Prepare a big glass jar (you can buy one from any provision shop) by washing it well and then drying it thoroughly. 3. Toss wine yeast powder with raisins to mix evenly. 4. Put inside the glass har. 5. Pour in the cooled syrup slowly. 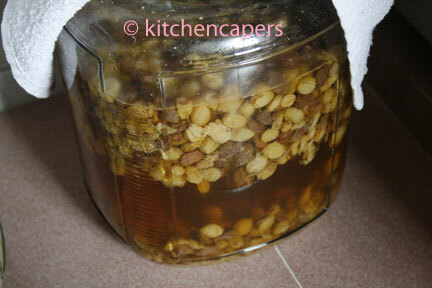 Seal the jar lid tightly and allow the liquid to ferment and mature in a cool, dry and dark place for 100 days. 6. 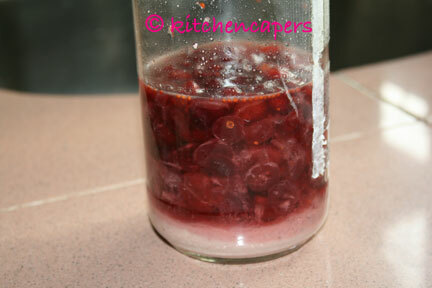 Keep the jar away from direct sunlight or any hot oven/stove. Best to keep it in a storeroom. Leave it covered for 100 days or about 3 months and more. After 100 days, sieve the wine out to be stored in the fridge. The raisins can be eaten like wine candy or used in making fruit cakes. I have made this before. It is really good. I left mine to ferment for about 5 months. The result is better. It is not that sweet anymore. It tastes a little like port but with a chinese wine after taste. Best to drink it cold. oy, share your experience leh 5 months? I cannot wait so long. I must hide it. I guess if you hide it in a corner, you won't remember its there. My aunt gave me this recipe. She said it's from her friend. The recipe is almost similar but mine uses more raisins and slightly more sugar. My recipe also boils the the raisins with the water & rock sugar. Cool down. Sprinkle both wine biscuits at the bottom of jar. Slowly pour in syrup & raisins. I always forget when I start my wines. Or sometimes I am so busy that i don't have time to harvest them. 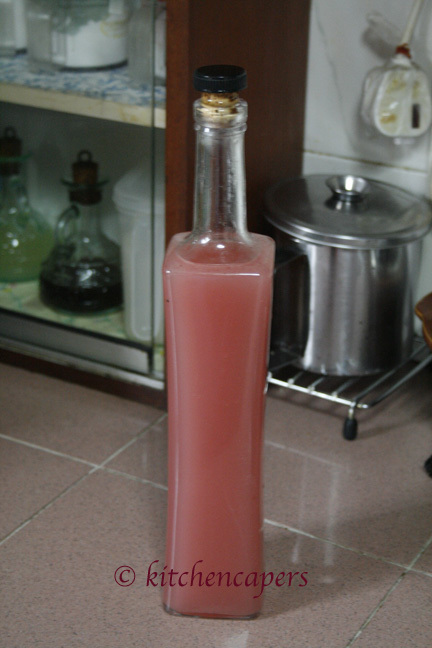 I find that fermenting longer for this wine brings down the level of sweetness. So, it's much nicer to drink. willin to share how you made your's here pls. Mine is made by boiling water & rock sugar. Then add in the raisins. Boil for 10 mins. Grind chow paeng and sprinkle into the jar. Scoop up the raisins and put into the jar. Slowly pour in the syrup. Supposed to ferment for 100 days but I fogot about it and let it ferment till about 150 days. This is the first time I am doing so I do not know how sweet it is supposed to be. But mine is not overly sweet. Could be because it was fermented longer, so more alcohol and less sweetness. This is just a guess. I have not tried making it again. Trying other wines first. How does the cranberry wine taste? Is it nicer than the raisin? However, Dried cranberry wine is super good! I am now making my 2nd batch. Ready to harvest by end June. Students who came to my house, all got a sip of the first batch. They loved the taste and flavour. Mmmm.... I wanna try. You just replace the raisins with the cranberries as per the recipe above? yes, using your mom's method. Same thing. Same fermentation period too.